At the Hunny Nurseries we strive to promote healthy meals and snacks that are both balanced and nutritious. Children have access to drinking water via a water station and theses are located in all their rooms. All of our meals consist of breakfast, lunch, tea, a mid morning snack and a mid afternoon snack. These are based on a three week rota. We operate an summer and a winter menu to offer plenty of culinary dishes and choice. To encourage children to keep hydrated during the day through the use of the drinking stations. 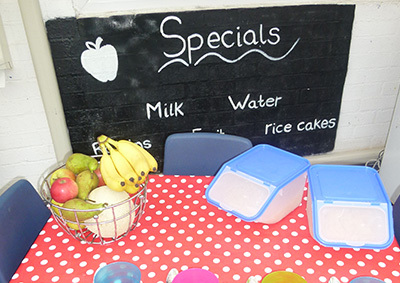 To provide a healthy lunch box for all outings the children take part in. To provide opportunities to grow and harvest fruit and vegetables in our green house and veg tubs. 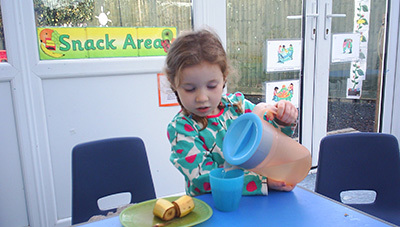 We monitor children’s snacks, meals and drinks. 90% of our menu items are produced from fresh quality ingredients each day. Because most food is produced from scratch we can ensure there are no additives or preservatives present and none of our products contain MSG or GM. All our recipes for desserts are modified to reduce fat & sugar. We aim to achieve 4 fruit or vegetables servings each day which is provided to the children through our healthy, nutritional and well balanced summer / winter menus both of which are followed over a four week plan. We have an excellent food hygiene rating with a top score of 5.